Meriden’s Giuffrida Park, has been a scenic park for over 300 years, and soon it could be the future site of a mine by Suzio York Hill Trap Rock Quarry Company. Some people feel mining the park will not preserve it’s natural beauty. 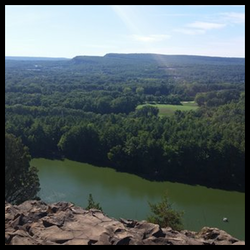 This 600 acre park is best known for its glorious views and its hiking trails. Many people have started protesting because it is one of the most popular parks in the Constitution State. There are many different hiking trails, all of various levels of difficulty. Most of the hikes are between 1 and 7 miles in distance. The Chauncey Peak trail is a challenging two mile loop, however, once you are at the top the views are spectacular. If you are really up for a challenge, you can include the Lamentation Mountain Trail in your hike as well. On a clear day you can even see Hartford and New Haven! Hopefully we can save this park from mining. Recently a Facebook page was created to help people become aware of this issue to and to help save this amazing park. Over 2,500 people have joined this group. Perhaps we can get a Washington Middle School petition started, and work together to try to save Giuffrida Park. Remember, MOUNTAINS DON’T GROW BACK! As middle school students we should be thinking about what high school we’ll be attending in our near future. We have our Meriden Public Schools options as well as private schools around the area that are available to new high school students. Our public high schools include Maloney High School and Platt High School, which offer variety of college preparatory courses, as well as course in the arts and some trades. Meriden also has a technical high school called Wilcox that is available to students who fill out an application to get accepted. Lyman Hall is a high school located in Wallingford and is available to Meriden students as well as Mercy and Xavier High Schools, which are both located in Middletown, Connecticut. You need to complete an application for Lyman Hall, Mercy, and Xavier as well. So although you may have to apply there is a variety of options that await you. Mercy High School in nearby Middletown, is an all girls, Roman Catholic private school that prepares young women for college. The students at this school are taught to grow emotionally, spiritually, academically and aesthetically. Their school’s slogan is, “Mercy Women Know By Heart.” Mercy also has a variety of sports including tennis, swimming, track, cross country, cheerleading, basketball, softball, golf, field hockey, lacrosse, soccer, and volleyball. Mercy is an all girls school so the students are able to take on every opportunity available. The school allows the girls to be the center of learning and leadership. If you plan on attending the school, students will have to fill out an application, give a record release form, and complete the Mercy High School entrance exam. Learn more about Mercy online https://www.mercyhigh.com/. Xavier High School, also located in Middletown is an all boys, Roman Catholic private school that helps students get ready for college, life work, and life in general. The school educates students about spirit, mind and body with a Christian framework. Xavier High School also introduces the boys to different cultures and the communities around the world. The school works to get students prepared for the rapid changes in their future. Xavier has many choices for sports too. Some include that same as Mercy as well as a rifle team, wrestling, sailing, and ultimate Frisbee. To join the Xavier High School community you’ll need to fill out an application, write an essay, take an entrance exam, and pay a fee. The school will also check your grades and take recommendations from your previous school. Check out Xavier online, http://www.xavierhighschool.org/. Lyman Hall High School is an agriculture based public school located in Wallingford, Connecticut. The school is full of academic classes and is one of the only schools in the state that offers courses of all career clusters. The school also gives the students a choice of four languages including Spanish, Italian, French, and Latin. Lyman Hall teaches kids about Agriculture Science. These courses include landscape management, aquaculture, food science, animal technology, plant science, and wildlife biology. The Regional Agricultural Science and Technology Education Center enrolls 225 students from Wallingford and nine surrounding towns. Many of its graduates attended highly competitive colleges and students can also chose to take classes that will learn them credits for college. For more information about Lyman Hall go to http://www.wallingford.k12.ct.us/page.cfm?p=11176. H.C. Wilcox Technical High School, also known as Wilcox Tech offers a variety of course selections that are meant to prepare students to go directly into an occupation in their field of interest upon their high school graduation. They prepare students for post-secondary education such as apprenticeship. Their core values are centered around team-work, respect for all, integrity, balance, fairness, and excellence. Wilcox has a Ninth Grade Exploratory Program geared towards their freshmen. The program introduces students to their trade/technical programs and is essentially an assessment of an individual’s technical aptitude. Their programs include automotive collision and repair, carpentry, hairdressing, electrical, culinary arts, heating/cooling and ventilation to name a few. Wilcox only accepts students by application only. For more information and for a full description of their trade and technology programs go to http://www.cttech.org/wilcox/. Francis T. Maloney High School, also known as Maloney High School, is a public school located right here in Meriden. This high school is open to any Meriden student and does not require an application. Maloney High School is very well known for its vast variety of clubs and after school activities, two of which being the football team and cheer leading squad. The staff at Francis T. Maloney High School make it their goal to prepare their students for the future and make sure that their students are role model citizens in the community. The expectations are that the students of Maloney will demonstrate communication skills through reading, writing, listening, speaking, and the use of technology. Maloney also encourages their students to participate in school and community activities as well as demonstrating proper behavior by showing respect for self and others. Go to on http://www.maloneyhs.com/ to learn more about Maloney. Orville H. Platt High School, also called Platt High School, is another public school open to Meriden students. This school teaches kids to demonstrate certain skills such as understanding, respecting, and responsibility. At Platt High School the students show communication skills through academics, technology and through artistic expression. Students will also learn about problem solving skills using critical thinking. The school teaches students to display healthy habits and life skills through respect and self-discipline. Platt High School teaches students to become responsible citizens by taking part in their community. To learn more about O. H. Platt High School, go to http://www.platths.com/Information/About_Platt/.